I have an old Veriton X270-ED5300C with nForce630i and I was wondering if I can upgrade the CPU to an Q9650 soket 775. As I knwo the mainboard supports all soket 775 cpus, but did Acer included suport for new CPUs in the BIOS? So, basicaly the Q9550 (with a better heatsink) is the fastes I can go on this machine. Do you have this heatsink? hmm ... so I should be able to go with the Q9650 too. Do I have to get a new heatsink too, or the one that's on the E5300 should be ok? I'm not sure if I have that specific heatsink but it looks the same. I don't play games, this is for my linving room PC - so what it does is internet surfing, and blu-ray movies, but I need more speed. 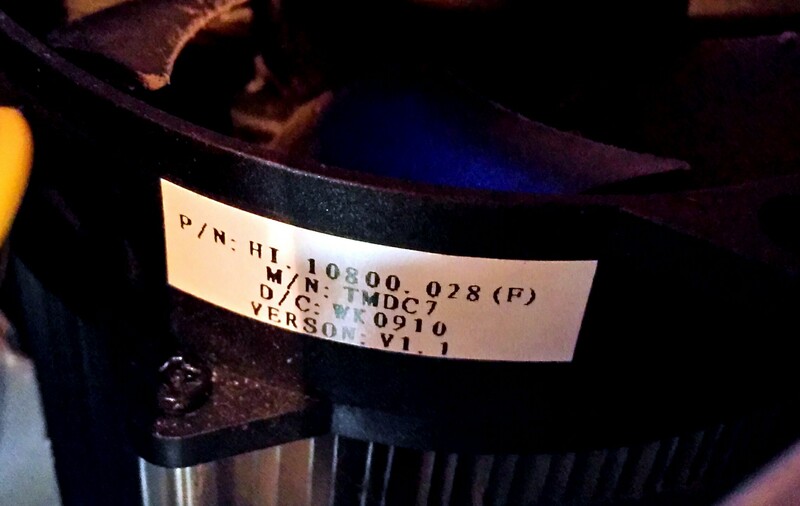 You'll find a white sticker on the CPU fan where is stated the part number. If it isn't an HI.10800.028 (95W), you'll have to replace it otherwise the CPU will overheat. Don't forget also to replace the thermal paste. I think that's the one I have installed. Yey! Here's a photo of the sticker. Is this motherboard limited at only 4Gb of RAM and only 2 SATA plugs? About the heatsink, that's good news! Up to 4 GB of DDR2 667/800 MHz SDRAM (single-channel support on two DIMMs). You only have two SATA connectors (orange connectors - your motherboard). Hmm, I understand. In this case I'm done with it, I already have 4Gb of memory and both SATA plugs are in used (HDD and a Blu-ray Player). Should I upgrade to Windows 10 - is this pc compatible? Sorry I don't know. I'm not yet an expert of Windows 10. I suggest you to create a new topic for this question. I will see if I'll get the win10, I'm not crazy about it anyway. From the provided list with the compatible CPU is the Q9650 the most powerfull I can get? That's the official list of the original processors so yes.